Legal Status: Diplomatic immunity as princess of Wakanda and later ruler of feudal Latveria. Relatives: Bashenga (ancestor), Azzari the Wise (Grand Father), T’chaka (Father), S’yan (Uncle), Ramonda (mother), T’Challa (1/2 brother), White Wolf (adopted brother), Jakara (1/2 brother, deceased) Storm (Sister in law ), T’shan (Cousin). Skills and Abilities: Exceptional martial artist and tactician trained from birth in Wakanda. Also skilled in the use of swords and magic. Powers: T’chana is a world-class magic user trained by Dr. Doom himself. She has displayed the power of flight, levitation, concussive force blasts, teleportation, electricity generation, summoning, telekinesis and the ability to disappear. Equipment: T’chana has access to “Doombringer” a powerful magical sword which she uses as a focus for her powers. It can also drain energy, it drained a whole city at one point [Marvel Mangaverse #5]. 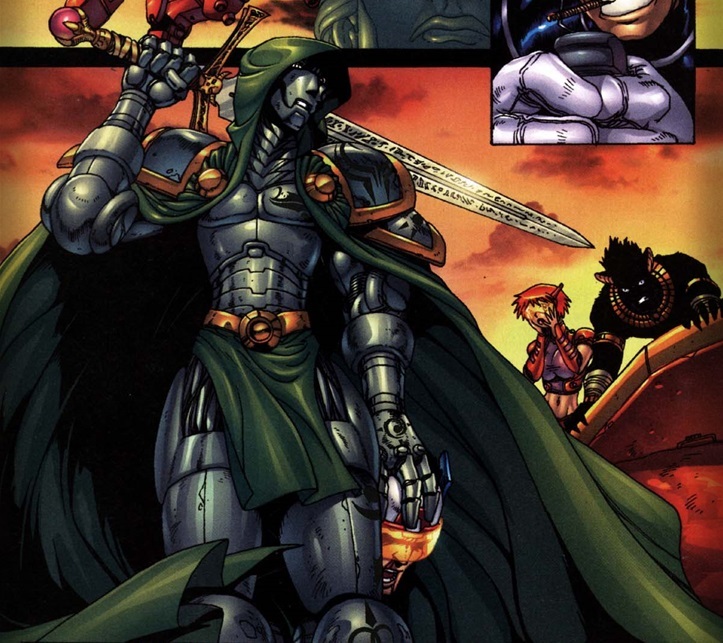 She also has access to Dr. Doom’s armor which she upgraded to allow her enhanced resistance to injury. It also allows her to remote control the doombots at her command and her floating fortress. T’chana is the sister of T’Challa and daughter of T’chaka born into the wakanda royal family of Black Panthers. Sometime in the past she faced T’Challa for the right to rule Wakanda. She was defeated and left for dead but managed to survive [Marvel Mangaverse #5] and flee to Europe where she started training in the use of magic and came to the attention of Dr. Doom ruler of Latveria. He took her as an apprentice and trained her in the use of her powers. Her latent aptitude for magic surpassed even her master and she learned all she could until she finally faced him in battle and defeated him, unknown to even those closest to him. 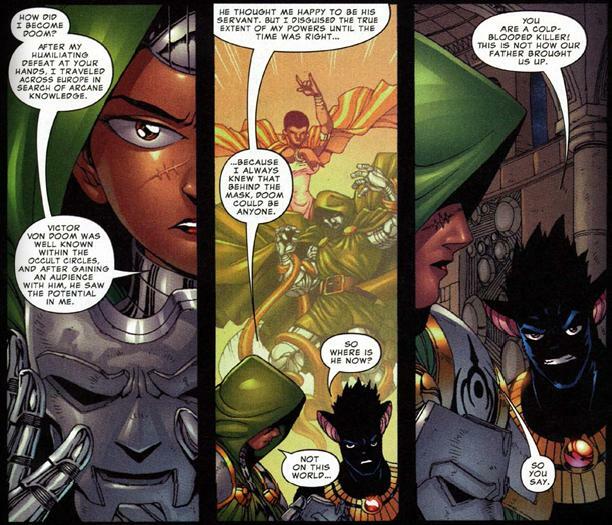 She took the mantle of Doom, leader of feudal Latveria [Marvel Mangaverse #6]. After Galactus attacked earth she realized that the earth was weak and her leadership would ensure their survival.When T’challa went to the UN to plead for assistance she interrupted the meeting and almost killed him with Doombringer [Marvel Mangaverse #4]. The interference of Captain America prevented this however. Later she engaged with Iron Man, Vision, Hawkeye and Captain America in combat and killed all of them [Marvel Mangaverse #4-5]. When confronted by her brother she finally revealed her identity [Marvel Mangaverse #5]. She proposed an alliance with T’challa but he refused and she continued to attempt conquering her world [Marvel Mangaverse #4-6]. She unleashed the Doom Mecha to destroy the city while the mindless ones dealt with Dr. Strange. When Strange banished the mindless ones and a good portion of the energy she had at her disposal to the Infinity dimension she was weakened enough for the heroes to attack her. Again she gained the upper hand against her brother who she planned to kill. This time though she was run through with her own sword the doombringer thus ending her threat [Marvel Mangaverse #6]. I need these issues where she appeared, in my life! fine article,it is useful to me and others to know about this items,please just keep it….